A spectacular Gold Coast sub-penthouse which hasn’t been lived in since selling off the plan four years ago, has been placed on the market by its Melbourne-based owner. 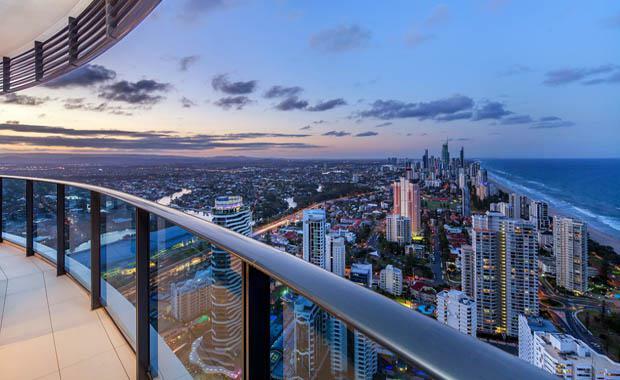 The 360 square metre skyhome occupies the northern half of the 47th floor of the Oracle tower at Broadbeach and boasts 270-degree ocean views through floor to ceiling glass. Selling agent Tolemy Stevens of Ray White Prestige Gold Coast said the opulent abode is being offered to the market for the first time since selling in 2010. Nobody has stayed a single night in the home. “This is a very unique property that certainly has universal appeal,” he said. The sub-penthouse boasts four bedrooms, three bathrooms, two secure car spaces and multiple open plan living areas. said the city’s penthouse market was on the up following a number of big ticket apartment sales through his office this year. “We have handled the sale of multiple penthouses this year, including the auction of one in Circle on Cavill for $3.2 million and another more recently at Chevron Renaissance. “The penthouse sector is subject to more buyer interest now than it has seen since the advent of the Global Financial Crisis. “The fact we are still well behind Sydney and Melbourne in terms of pricing means there are some great buying opportunities for our astute southern neighbours,” he said. The apartment, which is the only north-facing sub-penthouse on the market at Oracle, is encased in glass and features a wrap-around balcony with panoramic views. It features high ceilings, a designer kitchen with extensive stone and European appliances, and multiple living areas inside and out. Oracle has ground floor access to boutique shops, cafés, bars and restaurants. Its facilities include a resort-style pool and spa, heated lap pool, zen garden & tai chi lawn, sauna and steam room, gymnasium, teppanyaki barbecue, residents’ only lounge with bar and entertaining space, theatrette and temperature controlled wine cellar. The location takes advantage of the Gold Coast’s light rail network and proximity to Pacific Fair and Jupiter’s Hotel and Casino, both of which are undergoing multi-hundred million-dollar refurbishments. The property, will go to auction on October 30 at the Gold Coast Turf Club.